I didn't much want to read another biography of Robespierre. I didn't think it could add much to Ruth Scurr's chatty Fatal purity or Hilary Mantel's sympathetic imaginary reconstruction in A Place of Greater Safety. However, I was given Peter McPhee's book for Christmas, just started reading and have changed my mind. This is a brilliant book! 2. Throughout the book Maximilien is referred to as a "young man" - even, skipping forward, in the account of his death. This is a good reminder that Robespierre and co. did not set out as hardened ideologues; they remained men struggling to make sense of unprecedented events in terms of their (mainly classical) education and limited experience. 3. McPhee weights his evidence carefully. For Robespierre's personal life in Arras, there really isn't much - public speeches, a few letters and occasional writings, Charlotte's Memoirs, the overtly hostile testimony of the abbé Proyart. It is tempting for biographers to wring huge significance out of the tiniest detail; McPhee resists this. 4. He is hostile to pop-psychology. We should not base explanations of later events on Robespierre's supposed personality or childhood experiences. There is simply not enough evidence for psychoanalysis even if anyone wanted to attempt it. At the very least, the onus of proof is heavy on the historian. McPhee's premises his understanding on the assumption that Robespierre was an ordinary (if talented) man of his time. In particular McPhee challenges the view that the early loss of his mother and effective desertion by his father somehow warped Robespierre's personality. Since Maximilien mentioned none of it, all we have is Charlotte's testimony that he was deeply saddened by his mother's death and embued with a new seriousness and sense of responsibiilty for the family - both reasonable and unsurprising responses. The two brothers were taken care of by their youthful Carraut aunts whilst the girls lodged a few minutes away across town with their paternal relatives. Not ideal, but hardly traumatic. McPhee uses the evidence to conclude provocatively that Robespierre "enjoying a happy and supportive family life"
5. There is a heavy weighting in these opening chapters on Arras, its geography, its social and administrative hierarchies. The Robespierres belonged to this milieu. We follow Maximilien as he returns from Louis-le-grand and makes his way in the legal profession, negotiating carefully the complex structures of civil and ecclesiastical patronage and provincial social life. He was an ambitious young lawyer - these things mattered. There is no implication, as there is in other biographies, that he was disappointed not to remain in Paris after his education. 6. McPhee challenges the view that until the Revolution Robespierre was just a hopeless provincial no-body brought to the world stage by chance. This is a tempting view; as with other Revolutionary figures, before and after contrasts make for a good story. 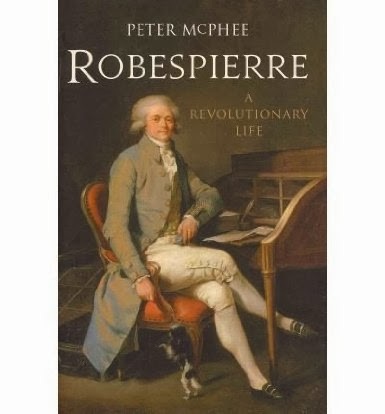 McPhee's Robespierre is a clever and successful young man on the make, confident of his own ability, well-established in a significant provincial capital and, in 1789, eager for his chance to contribute to political change. "The making of Maximilien: Robespierre's childhood, 1758-69"
"Integrating private and public in the life of Maximilien Robespierre"
It's a lovely book! I just got it a couple of weeks ago and am delighted with it – and with Max, who is now definitely in my personal Panthéon.